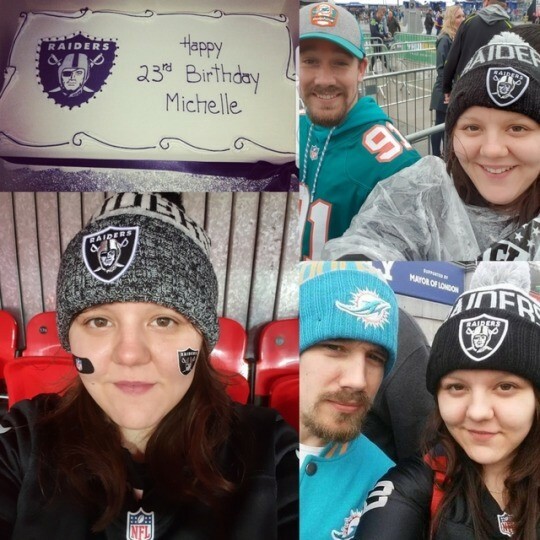 As part of our series in celebrating female NFL fans across the UK, I’d like to introduce you to Michelle McDonald, a Raiders fan. Michelle shares with us how she got in to the NFL, how she made the choice of her team as well as more about her overall experience as a fan. My name is Michelle, I’m 27 and for the last 6 years I have been an avid Oakland Raiders and NFL fan. How did a girl from the north east of Scotland become completely obsessed with this wonderful game you ask? It wasn’t until the following year however that I found myself interested in watching the regular season and finding a team of my own to support. I was very tempted to just stick with the Giants but thought I better give the other 31 teams a look before I committed. With absolutely no knowledge of any team or affiliation to any American city, I started very simply; The team logos. And like a moth to a flame, as soon as I saw that badass, eye-patched pirate it was decided. 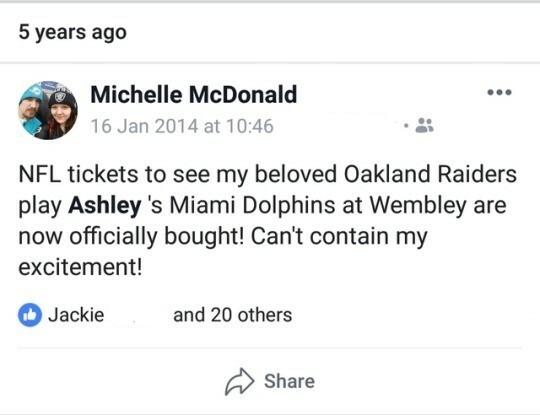 A few months later when it was announced that in 2014 the Raiders were coming to London to take on the Miami Dolphins it almost seemed like fate. Despite having to travel a 1100-mile round trip for each game it has been so worth it to meet other fans, experience tailgating and of course, see our teams play. A massive highlight for me during the London games has got to be meeting the American fans who travel over. In 2014, during my very first visit to Wembley, being new to the sport I was worried I would stick out as an inexperienced fan. My fears were soon put to rest when I stepped onto Regent Street and immediately met a group of ladies who had travelled over from Oakland. 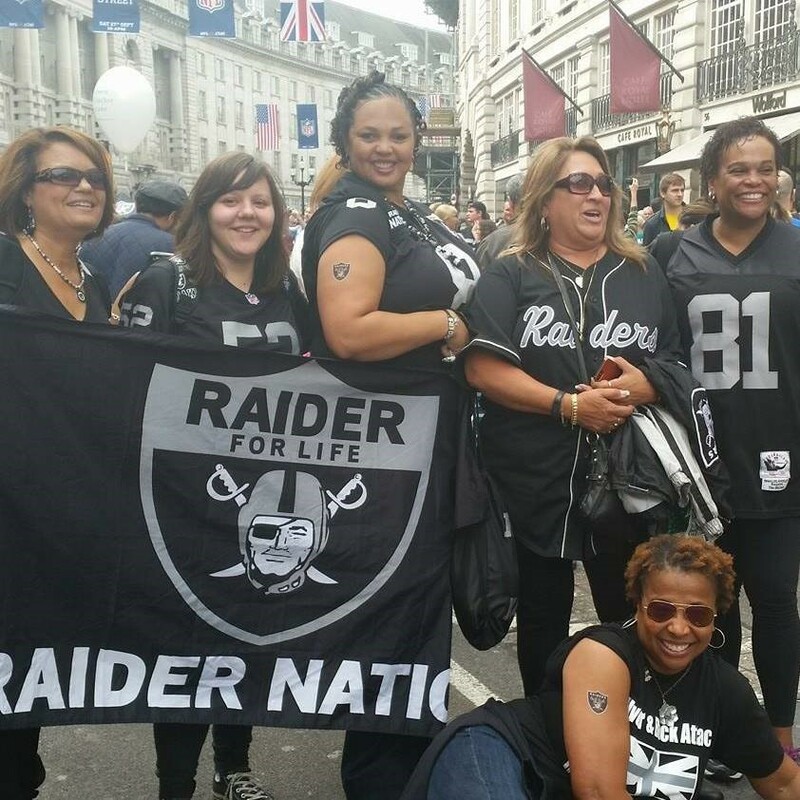 They were utterly delighted to meet so many UK Raider fans, not to mention found it hilarious to see a Raiders / Dolphins couple, and it was so wonderful to be welcomed with such open arms into the Raider Nation! So, has my overall experience of being an NFL fan been a positive one? Absolutely! Choosing the Superbowl over sleep 6 years ago was certainly the right choice! I can’t wait to see what this wonderful sport has in store for me next.